Maya Beiser, described as a "cello rock star" (Rolling Stone) and "ferociously adventurous" (San Francisco Chronicle), has released her latest album, TranceClassical, worldwide on July 29, 2016 with Innova Recordings. 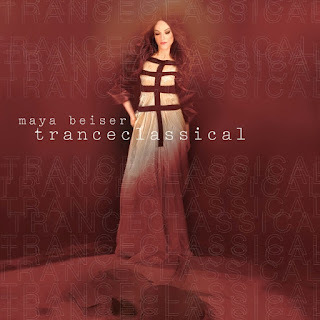 In TranceClassical, Maya explores music for cello that entrances, and that transforms and transcends boundaries, styles, and centuries. TranceClassical includes selections by a wide array of composers, brought to common ground by Maya's unique artistic vision – from J.S. Bach to Imogen Heap, from Medieval visionary composer Hildegard von Bingen to Wilco drummer and composer Glenn Kotche, from Arab-American composer Mohammed Fairouz's new Kol Nidrei to David Lang's take on Lou Reed's Heroin, plus world premiere recordings of music by Michael Gordon, Julia Wolfe, and David T. Little, and original arrangements by Maya. Maya's performance of J.S. Bach's Air on G, which opens the album, evokes the sound of an old LP, spinning on a distant turntable. Michael Gordon's All Vows takes the Jewish Yom Kippur prayer, the Kol Nidrei (which translates to All Vows) and reimagines it entirely. Maya melds cello and electronically transformed vocals, sung simultaneously while she plays, in Imogen Heap's mesmerizing Hide and Seek. Composer and drummer Glenn Kotche of Wilco contributes Three Parts Wisdom, a rhythmic and multilayered new work for Maya, described as "a soaring, gorgeous tour de force for solo cello" by The Washington Post. In Lou Reed's Heroin, arranged by David Lang, Maya sings the haunting confessional over her cello's arpeggios in a startlingly moving take on the original. Julia Wolfe's Emunah (or "belief") is an ancient-feeling vocal and cello duo expounding on the idea of devotion. Arab-American composer Mohammed Fairouz's new Kol Nidrei, in which Maya sings the text in Aramaic, also engages echoes of ancient cantorial styles, and has been described as "simply gorgeous" (The New York Times) and "luxuriant" (San Francisco Chronicle). David T. Little's driving Hellhound, written for Maya, is based on legendary bluesman Robert Johnson's 1937 song Hellhound On My Trail, which tells the story of a man pursued by demons. The album closes with Maya's plaintive but ardent arrangement of Medieval visionary Hildegard von Bingen's O Virtus Sapientiae.